The former security chief of Russian oil giant Yukos, Alexei Pichugin, has been convicted of murder and attempted murder by a Russian court. The conviction is the first among the former Yukos executives held in Russia - who include the firm's former head, Mikhail Khodorkovsky. Pichugin's lawyers have indicated they will appeal against his conviction. He was accused of carrying out the murders for Leonid Nevzlin, a key figure in Yukos' largest shareholder. Mr Nevzlin is now living in exile in Israel. He moved to Israel shortly before Mr Khodorkovsky was arrested. Critics of the Russian government have said Mr Khodorkovsky's arrest and the subsequent seizure of Yukos main assets were motivated by President Vladimir Putin's irritation at Mr Khodorkovsky's involvement in politics. But the Russian state has always maintained that it seized the asset because of back taxes owed by Yukos. According to Russian news agency Itar-Tass, Pichugin was accused of organising the murder of married couple Sergei and Olga Gorin in 2002. He was also charged with an attempt on the life of Olga Kostina, an aide to Mr Khodorkovsky. The trial was conducted in secret. It is a retrial after the original jury had been dismissed by Moscow City Court. The defence team acting for Pichugin has said it intends to appeal against the verdict. "If we don't succeed in getting the verdict annulled by the Russian Supreme Court, then we will take it to the European Court," lawyer Grigory Kaganer told journalists. "Actually, there is no proof," he said. Chris Black, a spokeswoman for Atco, a company representing both Pichugin and Mr Khodorkovsky, said that the bodies of the married couple had not been found and that Mr Gorin had had many enemies. "The government is using him (Pichugin) to claim that Yukos is a company built on blood," she said. She added that: "The first trial was abruptly ended in December when it became apparent the jurors were going to find Mr Pichugin innocent." Pichugin headed Yukos' security department until his arrest in 2003. He is due to be sentenced on Friday. 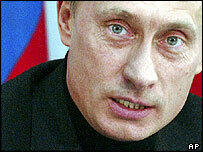 Mr Khodorkovsky, who owned his stake in Yukos before handing it over to Mr Nevzlin, was arrested in October 2003. 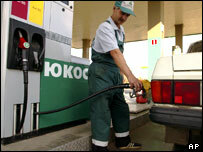 Platon Lebedev, another big shareholder in Yukos, was arrested before him, in July 2003. The Council of Europe, a human rights body, found Pichugin was "arbitrarily singled out" along with his former colleagues.